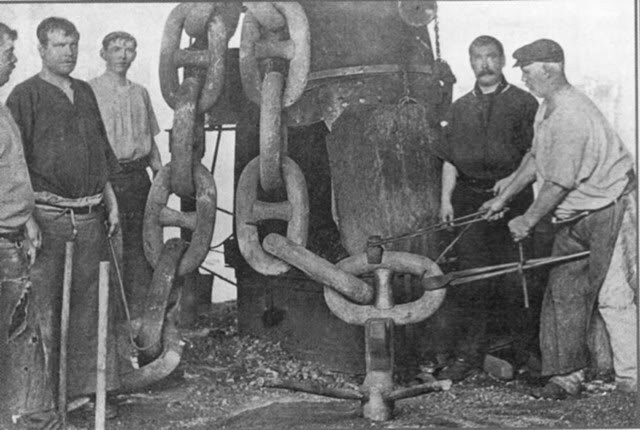 Ten teams of chain makers worked on Titanic’s anchor chains. Those chains were 3 3/8 inches in diameter. Note the cross piece on each chain link. It is called a "stud link chain." That middle bar is intended to stop the link from kinking or from deforming if it is under a heavy load. This 1911 photograph appears in Chain and Anchor Making in the Black Country, a 2006 book by Ron Moss. After she was launched on May 31, 1911 the ship was outfitted for sea duty. It took many months before those tasks were completed. She was finally ready for a sea trial on April 2, 1912.
Who was in charge of Titanic? Although most of the officers were the same, the crew that managed the sea trials was different from the crew assigned to the maiden voyage. Significantly, the chief executive officer William Murdoch was replaced by the less-well-liked (but friend-of-the-captain) Henry Tingle Wilde. E.J. (Edward John) Smith was the captain. Murdoch served as 1st officer during the voyage. With the addition of Wilde to the officer staff, the crew had an extra officer on board. David Blair, 2nd officer during the trials, was "beached" when the ship left Queenstown, its last stop before New York. It wasn’t just a question of crew shuffling. Blair, in an effort to keep the Crow’s Nest binoculars from being stolen, allegedly stowed them in his cabin. Later, when they were needed by Frederick Fleet as he scanned the horizon for icebergs, no one knew where the glasses were. Captain Smith, known for his fast crossing speeds, may have planned to retire after Titanic’s maiden voyage. He had set a record with Titanic’s older sister, Olympic. Charles Lightoller, the 2nd officer, and 3rd officer Herbert John Pitman were experienced seamen. So were the other senior officers. Bruce Ismay, son of the founder of White Star Lines, represented the company during the crossing. His presence (and actions) would raise troubling questions during subsequent hearings. Thomas Andrews, with eight of his best men, would trouble-shoot problems. The company had already solved one major problem. At the time of Titanic’s historic voyage, a coal strike meant insufficient supplies for each ship. Several Atlantic crossings had been canceled in favor of Titanic. People and coal, originally assigned to other ships, were reassigned to Titanic. Bos, Carole "TITANIC'S CREW" AwesomeStories.com. Mar 01, 2004. Apr 23, 2019. Should a Ship Leave Port When Needed Equipment is Missing?